One of my (many) flaws as a blogger is only sharing the dreamy memories. I love to write about blissful strolls through markets. Endless afternoons on sunny beaches. Terrific resorts. Tantalizing food. You get the idea. I tend to leave out the "and then the two-year-old had a meltdown" or "my five-year-old complained the entire time we were there" moments. Yes, they happen. We deal with them and move on, and try not to get hung up on it or let it ruin our experience. They're rarely what I remember most about our travels anyway. Maybe that's a survival mechanism? Aside from those normal frustrations, though, we have had some interesting experiences of rotten luck during our year of traveling around Europe that are worth sharing. We've learned some valuable lessons from them, but my biggest takeaway from it all? My kids handle unfortunate situations much better than I do. SICK IN SCANDINAVIA, Summer 2013. A week in Scandinavia was our first major voyage into Europe with the kids, having just moved to England the previous month. For the most part, things went really smoothly. And then my husband and I both got sick halfway through the week. Fortunately, it only lasted about 24 hours. We were both feverish, achy, and exhausted, but we were able to care for the boys which was my biggest concern. Always pack some basic medicine. Once we had some ibuprofen in our system, we were much more functional. Do something easy and let go of your planned itinerary. After staggering through Gothenburg the night before, we gave up on the idea of more sightseeing and just headed to a children's museum near our hotel the next day. Kids had a ball, and my husband and I moved from bench to bench, supervising them but also resting. Research your medical options in advance. Where's the closest hospital or 24-hour medical center to where you are staying? This is especially important if you're staying in a rental property, where there isn't staff to ask like you'd have at a hotel. Universeum in Gothenburg, Sweden. A fun place for kids to play and parents to rest. CANCELLED PARIS TRIP, Fall 2013. Again, sickness struck, only this time it was my kids and it happened before we departed for a planned trip to Paris (I wrote all about the yucky details here.) I still haven't emotionally recovered from the disappointment. Always get trip insurance. This would have covered our apartment rental and pricey train tickets. As it were, we basically paid for a trip we never took. Le sigh. CAR PROBLEMS IN PORTUGAL, Winter 2013. We rented a car to drive from Lisbon to the Martinhal resort in southwest Portugal. It's about a three hour drive. The car didn't seem quite right from the beginning, but I ignored the issue and kept driving. 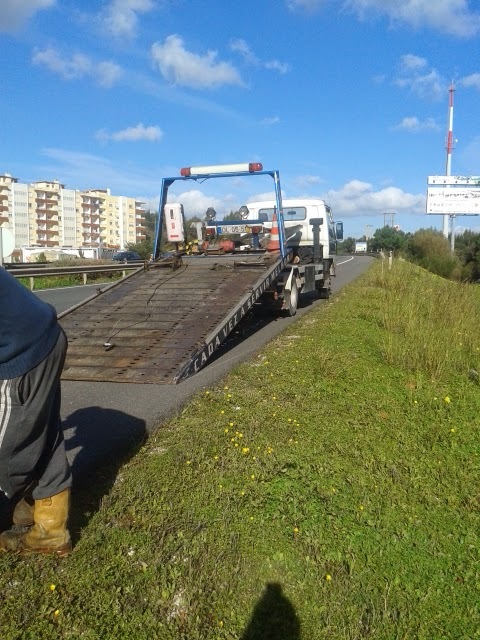 Long story short, we found ourselves stranded on a Portuguese highway. Eventually, we got to our resort, albeit 5 hours later than expected. Not what you dream of when you imagine a Portugal vacation. Ask when you pick up your car what to do in the event of an emergency. Our paperwork was in Portuguese, meaning we called about 5 numbers before we got the right one. Doing so while stuck on the side of the highway was not ideal. My friend Keryn at Walking on Travels wrote a really great post on what to do when you have an accident in your rental car. CLOSED EUROTUNNEL, Spring 2014. 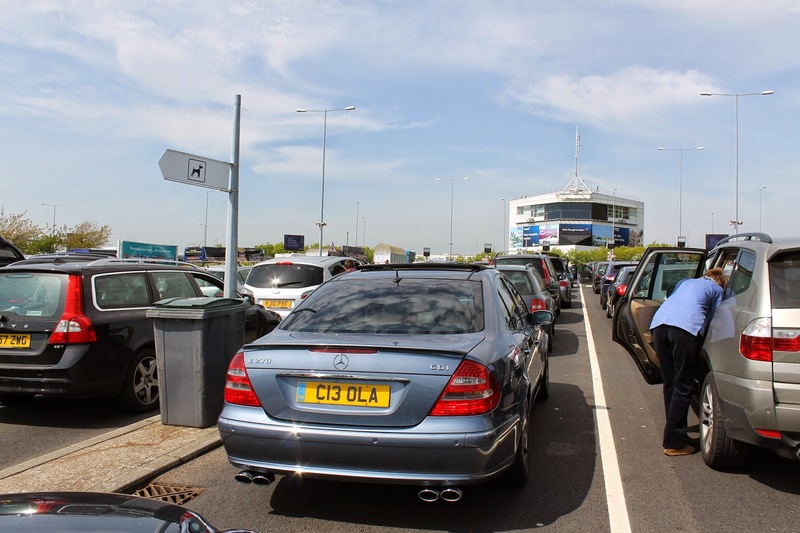 We had planned to drive through the Eurotunnel on our way to Belgium over the Easter holiday. All seemed fine until we were parked in line to board the train (you actually drive your car onto a train, much like you would a ferry). Suddenly, delay signs flashed up on the screen and announcements started blaring from a loudspeaker across the parking area. All in all, we were stuck in a parked car for 4 hours before we were able to cross the Channel. Yikes. Our view for four straight hours, with two kids in the backseat anxious to get on with the journey! Always, always pack a few more snacks and diapers than you think you'll need (bottle feeding a baby? Ditto those supplies.) I was kicking myself that I didn't get up 5 minutes earlier in the morning to make a few PBJ sandwiches, as I had intended to. Luckily, we bought the last two hot dogs before the parking lot vendor sold out. I share some of these, not to scare you away from your own adventures, but to show you that a) even when travel isn't picture perfect, it's still worth doing, and b) we can do things to be better prepared the next time around. This post is a part of Travel Tips Tuesday at Suitcases and Sippy Cups and Walking on Travels.